WASHINGTON, D.C. -- Healthcare, the economy and immigration top a list of issues that voters consider important to their vote for Congress this year. 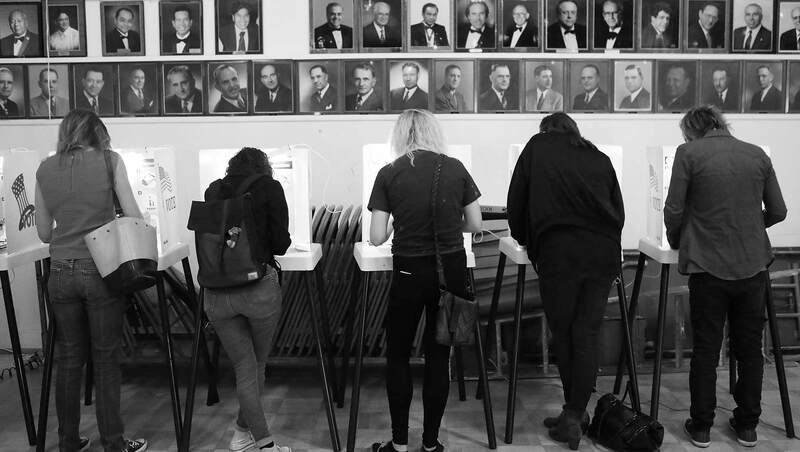 Other issues that at least seven in 10 voters rate as "extremely" or "very" important include the treatment of women in U.S. society, gun policy and taxes. The investigation into Russian involvement in the 2016 U.S. election and climate change rank at the bottom, although roughly half still consider them important. How important will each of the following issues be to your vote for Congress this year? Way income and wealth are distributed in the U.S. These results are from Gallup's Midterm Election Benchmark poll, conducted Oct.15-28. The majority of registered voters describe 11 of the 12 issues tested as extremely or very important to their vote -- the only exception being the investigation into Russia and the 2016 election. Voters' rating of the economy's importance since Gallup began tracking these measures in 2002 has generally trended inversely to how well the economy is doing. Just over eight in 10 rated the economy as highly important to their vote in 2002 and 2006 when the economy was doing OK, but this jumped to 94% in 2010, in the aftermath of the 2008 mortgage crisis and the 2007-2009 recession. It receded to 88% in 2014 during an improved economy and to 78% today, as the economy is enjoying low unemployment and relatively strong GDP growth. 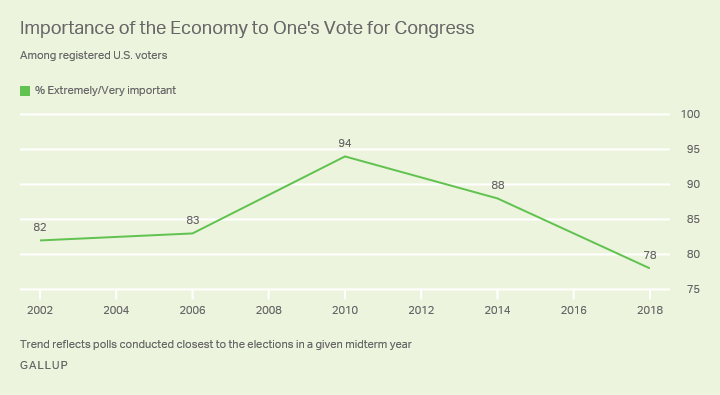 The current importance rating for the economy is the lowest of the five midterms dating to 2002. The importance of immigration is higher this year than in 2006, 2010 or 2014. Voters rate climate change as more important this year than in 2014, the only other time it has been measured. There has been little change in the perceived importance since 2014 of foreign affairs and the way income and wealth are distributed in the U.S. Voters' views of the importance of healthcare have been generally stable over recent midterms. There are, as would be expected, large differences between Republican and Democratic voters in the importance they place on many of these issues. Overall, the average importance rating across the 12 issues for Democrats, including Democratic-leaning independents, is 73%, compared with an average rating of 61% for Republicans and Republican-leaning independents. The two issues with the biggest partisan gaps in perceived importance this year -- more than 40 points -- are climate change and the Russia investigation. 75% of Democrats and only 27% of Republicans rate climate change as important to their vote for Congress. The Russia investigation receives an importance rating of 66% from Democrats vs. 19% from Republicans. Two other issues of much greater importance to Democrats than Republicans, both of which have 30-point partisan gaps, are the way women are treated and the way income and wealth are distributed. There is a 15-point partisan gap in ratings of the importance of healthcare. Three issues are significantly more important to Republicans' vote for Congress than to Democrats': the economy, taxes and immigration. The gaps for these are relatively modest, between 10 and 13 points. All are or have been key talking points for President Donald Trump and Republican candidates. Overall, Republicans say the issues most important to their vote for Congress this year will be the economy, immigration and taxes. For Democrats, the top issues are healthcare, the way women are treated, and income and wealth inequality. Gun policy is among the top five issues for both partisan groups. The confirmation of Brett Kavanaugh to the Supreme Court is one of the least-important issues to Democrats, while it appears higher on the importance list among Republicans. Two of the high-profile focus points of Trump and Republican congressional leaders over the past year -- taxes and changes in U.S. trade and tariff policies -- are dead last on Democrats' importance list, while they appear higher on Republicans' list. The four issues of the least importance to Republicans are the Russian investigation, climate change, income and wealth distribution, and the way women are treated in U.S. society. 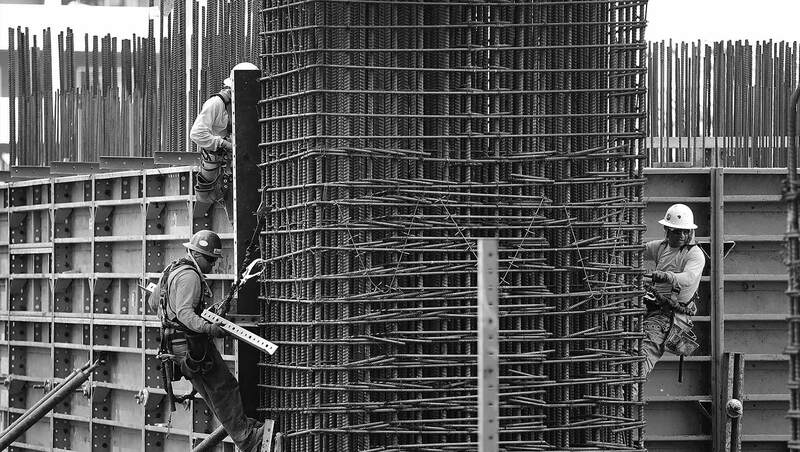 After reviewing the importance of issues in the 2014 midterm elections, Gallup concluded: "No candidate for office in this year's midterm elections will go wrong in emphasizing what he or she would do to fix the economy and create more jobs in the U.S." This year, that conclusion is still appropriate in general, as the economy is the second-most-important issue on the list tested among voters. But a focus on the economy may not have the same payoff this year as in the past, given that on an absolute basis, the economy is rated as less important now than in 2014 and as less important than it was before any midterm dating back to 2002. Immigration, in turn, has become a more important issue this year, and healthcare remains important. The wide gulf between Democrats and Republicans in the importance ratings given to several issues creates interesting and important decisions for House and Senate candidates in "swing" districts and states. These candidates could in theory increase turnout by emphasizing issues that have higher priority on the list for one party than for the other. These hot-button issues for Republicans would include the tax cuts, trade and tariff policy and the Kavanaugh confirmation. Among Democrats, the hot issues would be the #MeToo movement, income and wealth inequality, and climate change. But these may not be the most salient issues for wavering swing voters. The strategy to reach these voters would presumably be to focus on issues whose importance is more universal across party lines -- healthcare, immigration, gun policy and -- despite its lower importance this year compared with previous midterms -- the economy.